A WORLD RENOWNED scientist and broadcaster who hails from the Fens has written a book all about genes, genetic engineering and human nature. For years Brian J Ford, of Eastrea, has been known for making complex scientific theories easy to understand. And his sometimes unusual theories have often taken the scientific world in new directions. Mr Ford says that civil wars could be like the bodys auto-immune response when we contract a virus the body fights back. Taken to its logical conclusion this means that people fight their neighbours because they want to eradicate them the way body cells want to eradicate similar but different invaders. Mr Ford claims that people could be behaving just like their individual cells. The book also looks at genetic engineering, including modification of food to make it more commercial. 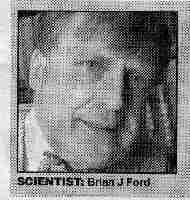 BRIAN J FORD is science editor for the Guinness Book of Records, a Fellow of the Institute of Biology and a former Kings School pupil. He rose to fame on popular science programmes and his book, released this week, is proving popular with book stores. He said, I write quickly so the book only took a couple of weeks, but the thinking and research behind it took some time. I always do my best thinking on a beach  be it Tonga, the Gulf of Mexico or Hunstanton and Wells-next-the-Sea. He recently invented a tiny microscope for conducting scientific experiments in space. See also the GENES AND THE FIGHT FOR LIFE web page; press reviews; or move to the previous profile: An evening with Brian, Chicago, 1998 or the next profile on the site: Brian J Ford - profile 1999.